How much yerba mate should you drink? I guess there is no single answer to this question because much depends on the habits, health and particularities of each consumer. Despite of this, it is safe to say that excesses should always be avoided. In general, there is no limitation to how much yerba mate you can drink. However, some situations deserve more precautions and moderate consumption. According to research published by respected medical sources, it is necessary to limit quantities if you suffer from any health conditions which require you to control fluid intake, such as kidney diseases. The same recommendation applies to those with a stomach or intestinal condition, since mate is an intestinal stimulant. Special care should also be taken by people who take diuretics for hypertension problems, as mate will amplify the diuretic effect. According to the American Pregnancy Association, pregnant women should decrease their caffeine intake to about 150 to 300 mg a day, limiting the exposure to the fetus, which lacks the necessary enzymes to metabolize caffeine. A standard mate contains about 90 mg o caffeine per cup, which suggests that drinking up to 3 cups a day should be completely harmless. At least, according to the American Pregnancy Association. A 2005 study carried out in Southern Brazil, monitored 5000 pregnant women of which 70% admitted drinking yerba mate daily. The results showed that contrary to the hypothesis, no harmful effect on intrauterine growth or duration of pregnancy was detected. In South America, as Mate is the National Drink of Paraguay, Argentina, Uruguay, and Southern Brazil, mate is safely consumed by thousands of women during pregnancy. No mater what the studies say, the safest bet here is to keep consumption under the 300mg/day limit. If possible, avoid the first brew which contain the most amount of caffeine. People who have difficulty sleeping, should avoid drinking mate after 6 p.m., but in this regard it is necessary to say that not all people react the same to the stimulating effect. But for this reason, people who are irritated or easily stressed, should consider restraining their consumption of mate. 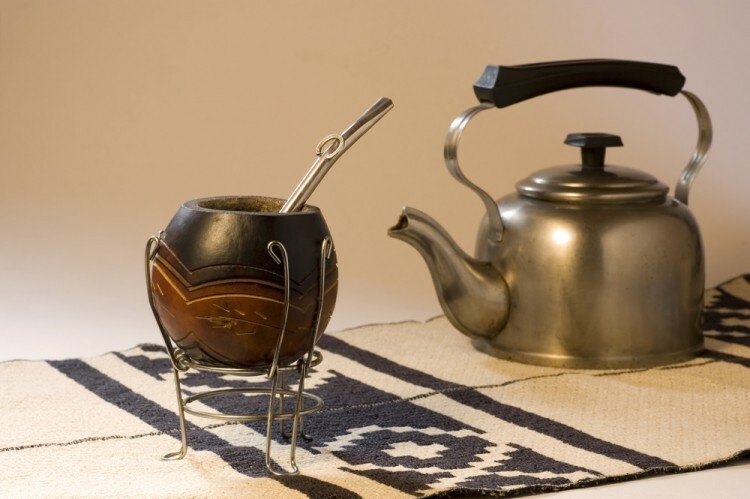 Much has been written and speculated about wether yerba mate can or cannot cause cancer. The absolute truth now is that there is no proof that drinking yerba mate can cause cancer in any way. It has, however, been observed that drinking large amounts of hot liquids over long periods of time may lead to esophageal cancer. Due to this, it is recommended to avoid consuming yerba mate at very high temperatures. Drinking yerba mate at moderate temperatures is not only healthier, but helps lessen the bitterness of the infusion as well as prolonging the taste of each serving. Another issue to consider are the snacks usually consumed when drinking mate, which may themselves be bad for your health. Healthy mate is bitter mate. Adding sugar to the infusion, incorporates empty calories to the drink, which add no beneficial nutrients. Avoid drinking mate together with foods containing high percentage of carbohydrates and fats, like cookies, biscuits and cakes. An excess of mate may potentiate the stimulatory effect and generate too much excitability. Also, remember that mate has a diuretic effect, which on hot days can cause dehydration. So as you can see, apart from some situations where you need to be cautious, mate is a faithful companion that has no major contraindications.